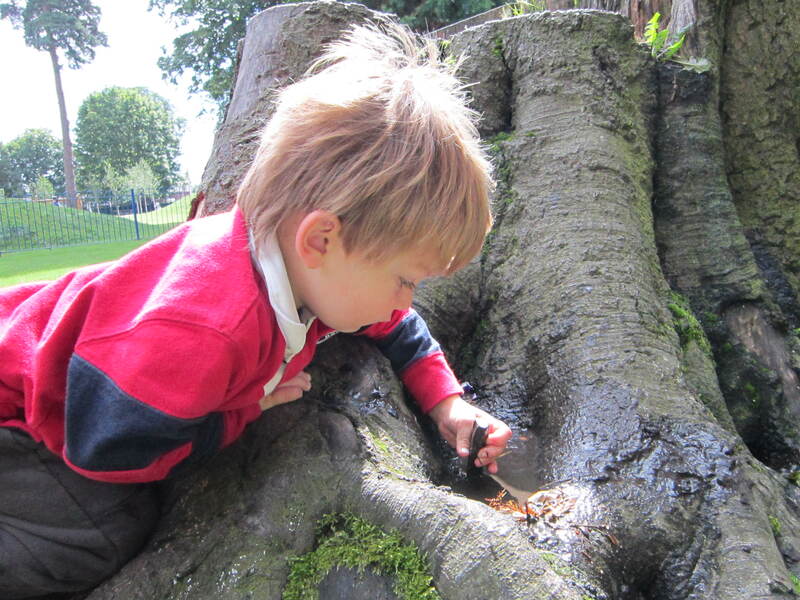 Mud is a wonderful sensory material to play with, being sloppy, crumbly, mouldable or sticky depending on how much water is added. 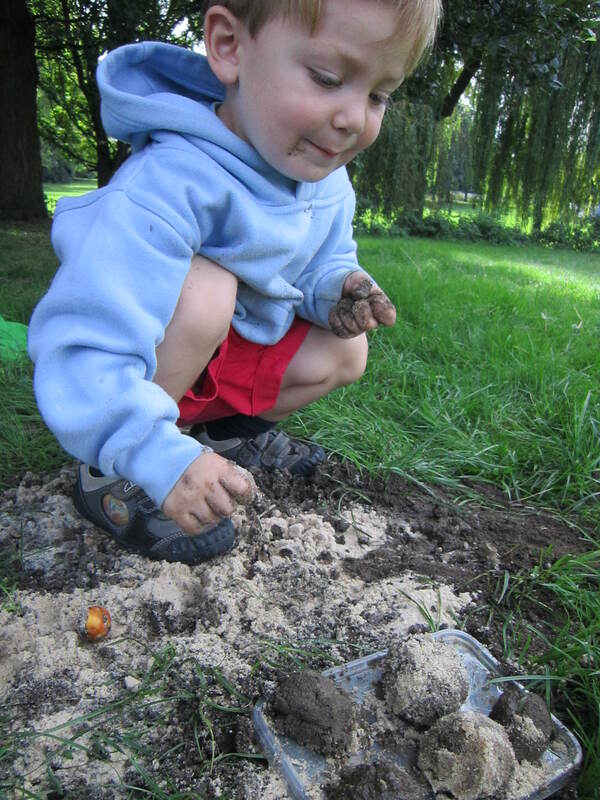 When playing with mud, children are unconsciously conducting scientific experiments about the physical properties of this material. It stretches developing creativity, becoming pies, puddings, chocolate spread or ice cream! It feels soothing, cool and squishy to little hands. They love stirring it with sticks to make ‘recipes’. 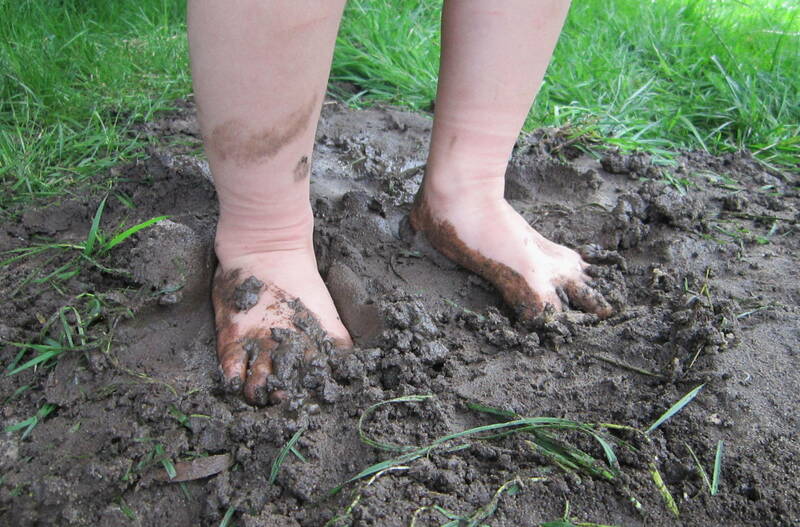 Mud is also the most basic stuff our planet is made of. And best of all, it’s free! 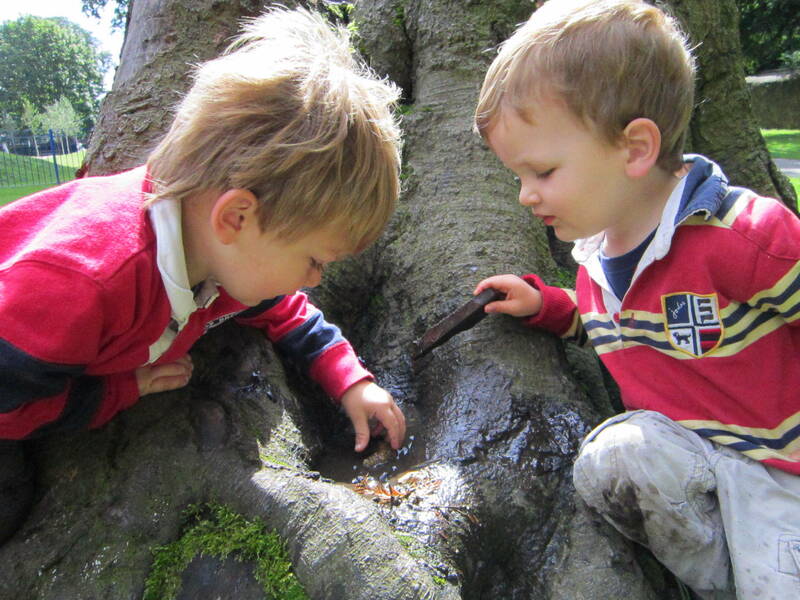 The mud hole in this garden is the most popular place to play for this group of 3 and 4 year olds. 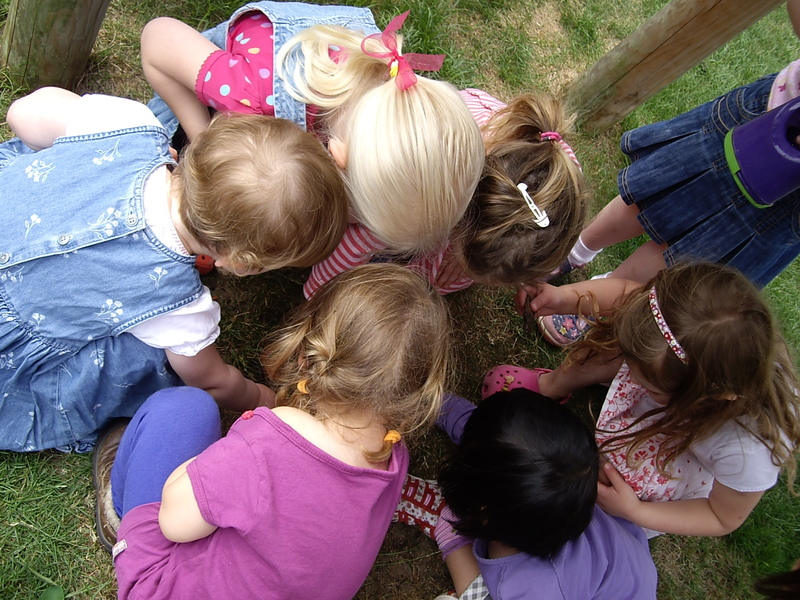 Children relate to the world around them primarily with their physical senses, and through their hands most of all. What the hand does, the mind remembers – words alone can’t reach. 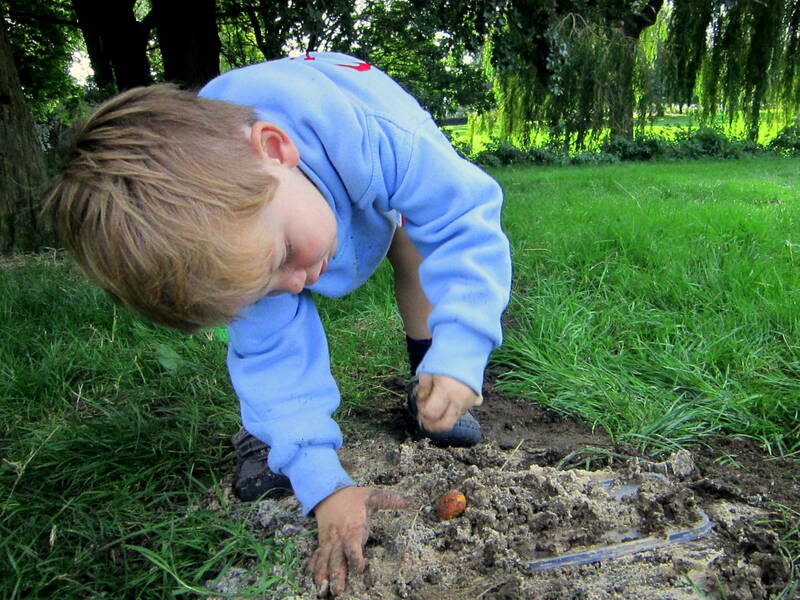 There is no substitute for direct physical hands-on experience in learning about the world. 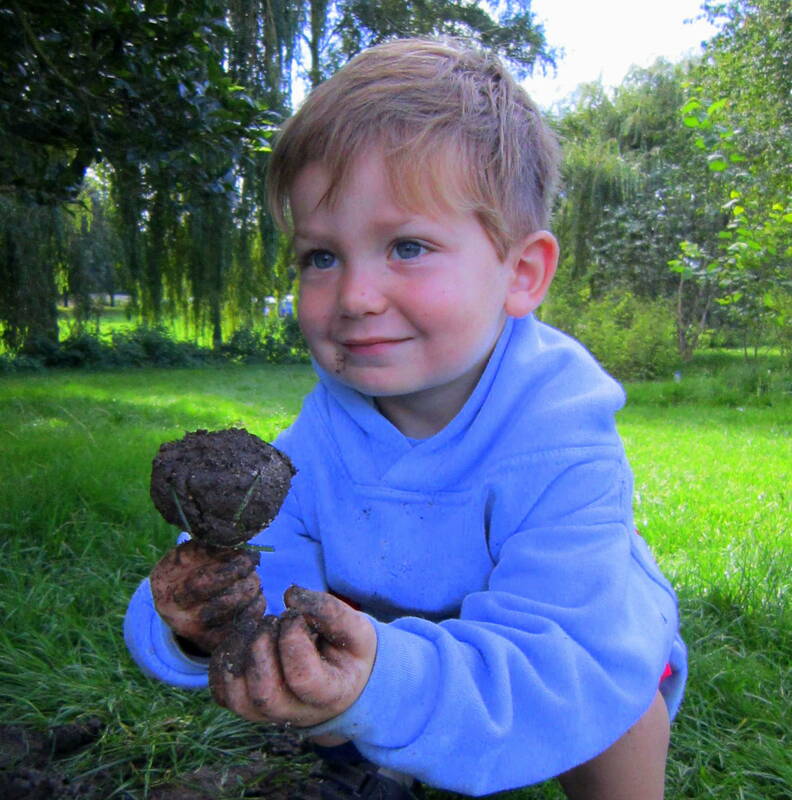 Trees and tree stumps after rain tend to have wonderful little holes and pockets of mud, which make lovely natural mixing bowls for making mud pies and soup! 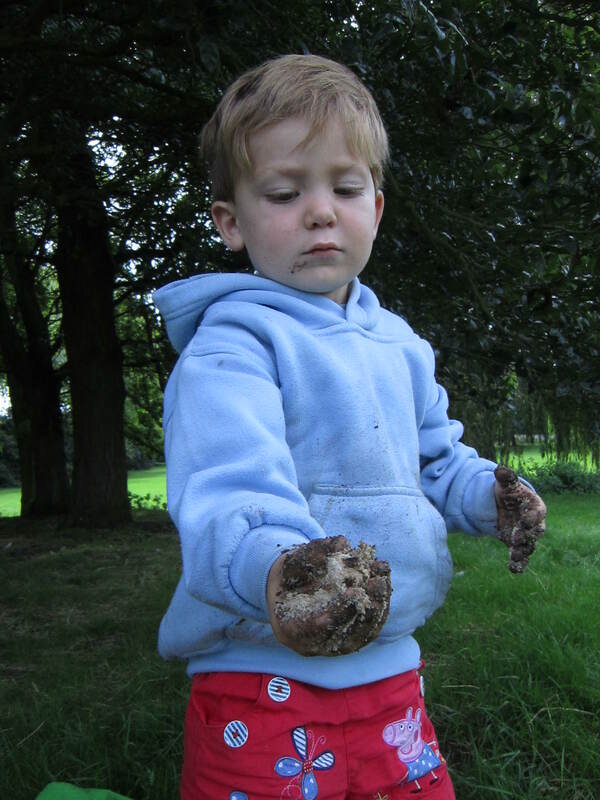 We often discover different types of mud in there (leaf mold, sandy mud, black soil etc) and like to add little leaves, stones and bits of bark and then stir it all up with a stick! 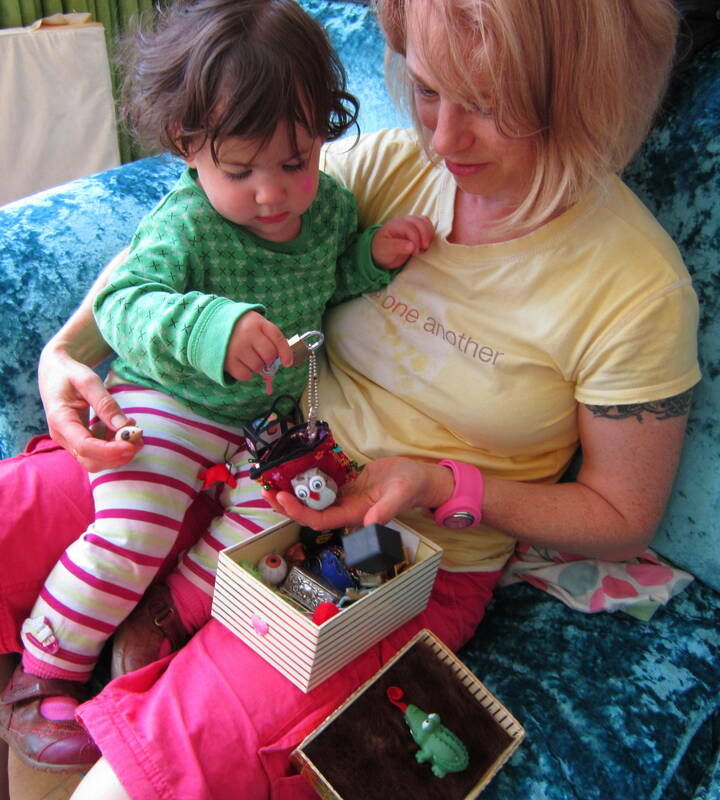 It’s a very satisfying activity to share with a friend, whether you’re 2 or 3… or 5 or 6…. 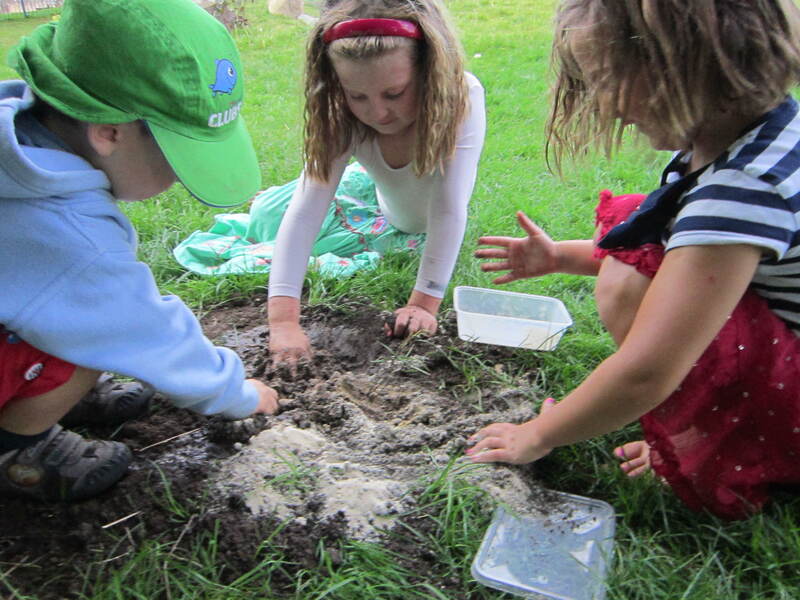 Mud is almost infinitely versatile as a sensory play material. It can be solid, liquid, stirred, moulded into shapes (I made some mud birds today), formed into figures, pancakes, pies, volcanoes, lollipops or birthday cakes and decorated with sand ‘icing’, little cones and stones…it richly stimulates a child’s imagination as well as affirming their sense of connection to the earth. I believe a profound inner stability and peace can come from being grounded and aware of our relationship with our planet, and feeling free to explore, create and dream. 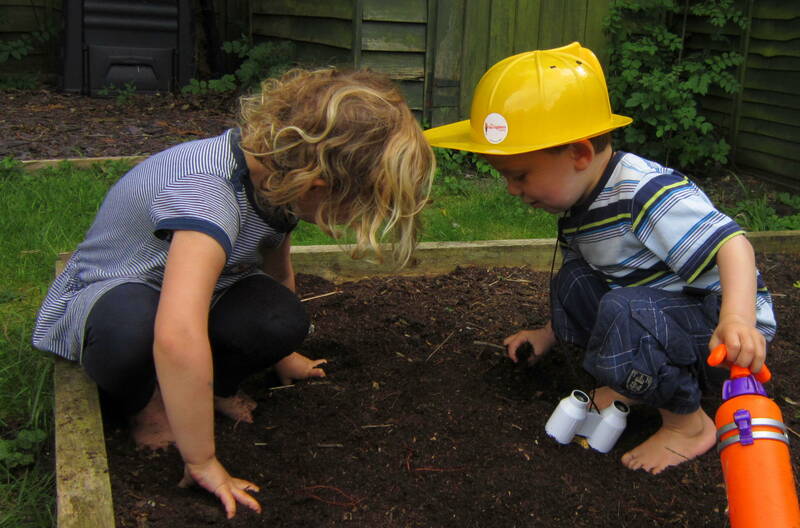 In allowing sensory play, we focus mainly on kids doing messy stuff with their hands. We tend to underestimate the importance of feet in connecting and sensing our natural environment. Feet are surprisingly sensitive. Today at the park, the 2 year old stopped halfway between the tarmac path and the grass, looking thoughtful. Turning back, I could see he was feeling something interesting. With one foot on the path and one on the grass, he commented, “This foot warm and this foot cold”. I took off my shoes to feel what he felt. “Oh yes, the grass is cool and soft, and the path is warm and hard! Good noticing!” He had loved “feeting” the salt dough too. 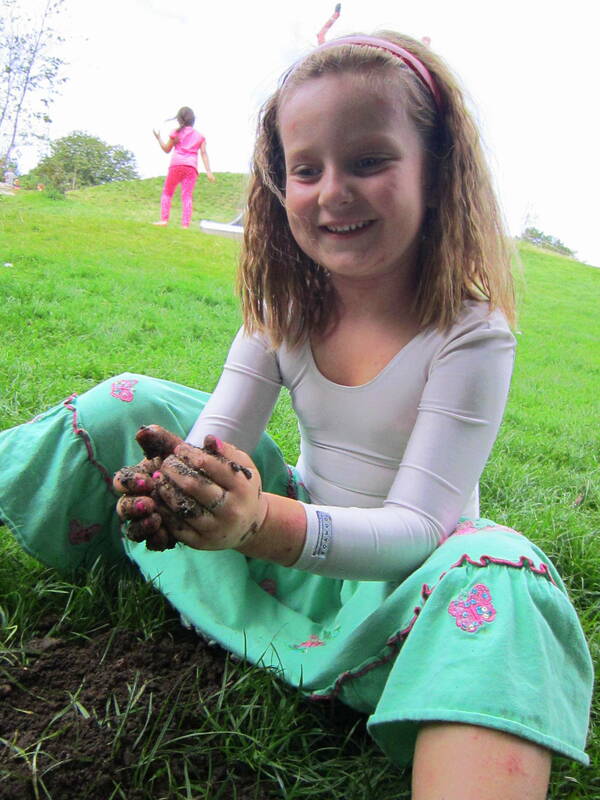 A little later we began making mud pies in a molehill we discovered under the trees. 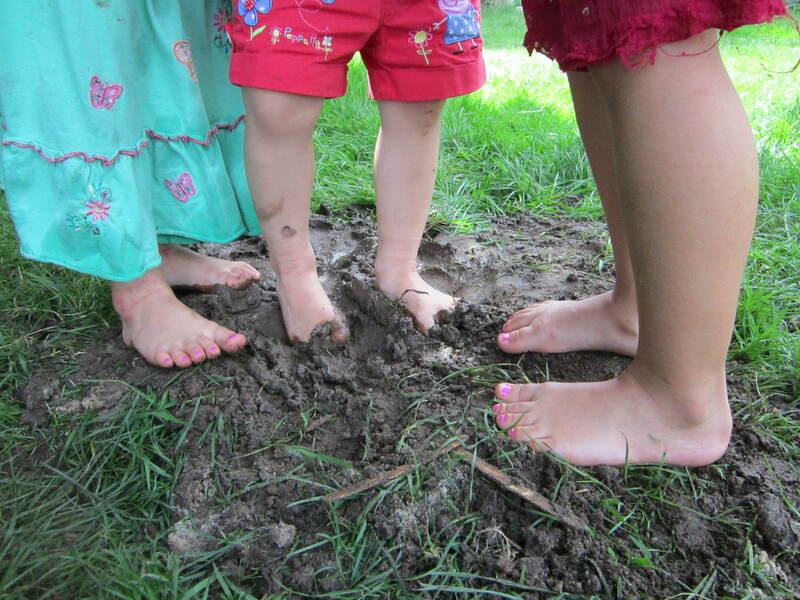 He was very keen to get his toes as well as his hands into the mud, and his sisters soon overcame their conditioned ‘girly’ reluctance and joined in! After all, it felt so cool and squishy between the toes! I believe (from observation) that keeping clean is a completely alien concept to small children. They haven’t yet acquired the cultural selfconsciousness to be aware of their appearance, and their lives are all about living the experience. (Bath time is just another sensory experience). They don’t worry about tomorrow or hold back from being fully present in the moment. Getting messy is merely a side-effect! If only we could all live like this.